Blind and fiercely committed to his priesthood, Father Patrick J. Mascarella had more than a heightened sense of touch that helped him orientate himself in his physical surroundings, he knew how to touch other’s lives by offering Christ’s healing in their brokenness. 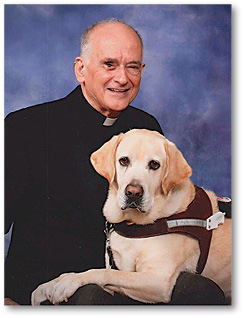 Father Mascarella poses for a portrait with his service dog Pace. Father Mascarella passed away late Wednesday, Jan. 23 at Our Lady of the Lake Regional Medical Center in Baton Rouge, where he was recovering from recent heart surgery. He was 77-years-old. Father Mascarella was born on April 12, 1941 in Baton Rouge. He attended St. Joseph Seminary in St. Benedict and Notre Dame Seminary in New Orleans, where he graduated in 1963. He was ordained a priest on Dec. 17, 1966, by Bishop Robert E. Tracy, at St. Aloysius Church in Baton Rouge. 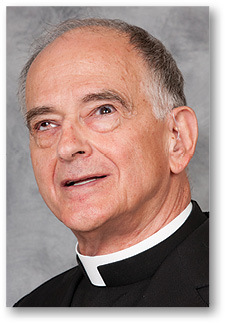 Father Mascarella served as pastor of St. Isidore the Farmer Church in Baker; Immaculate Conception of the Blessed Virgin Mary Church in Denham Springs; and, Christ the King Church and Catholic Center in Baton Rouge. He also served as parochial vicar for St. Charles Borromeo in Baton Rouge; St. Theresa of Avila in Gonzales; Our Lady of Mercy Church in Baton Rouge; Christ the King Church and Catholic Center in Baton Rouge; St. Joseph Church in Paulina; Most Sacred Heart of Jesus Church in Gramercy; and, St. Michael Church in Convent. He was director of Continuing Formation of Priests from 1984 – 2007 and was a member of the College of Consultors from 1970-1973. Father Mascarella, who celebrated his golden jubilee in 2016, introduced key programs on stewardship on the church parish level, directing continuing formation for priests and helping to create and adopt new ways of evangelization through faith-based classes, retreat leadership and increased liturgical participation. Father Mascarella lost his eyesight to multiple eye conditions that likely began when he was a young boy. When he retired in 2009 at the age of 68, he was an inspiration to many simply by his daily walk and trust in God’s will, according to those who knew him. Always seen with Father Mascarella on those walks, as well as at Masses and anywhere he went, was his faithful companion and guide dog, Pace. Father Mascarella described Pace as a “compassionate dog who is especially attuned to the feelings of others.” He said Pace’s favorite place to visit was LSU because he would take Pace’s harness off, meaning he was off duty, and the students enjoyed playing with him. 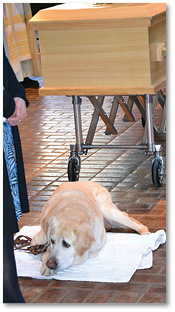 Pace received the Service Animal of the Year Award by the Governor’s Office of Disability Affairs on Dec. 13, 2011. Pace is currently living with family members of Father Mascarella. Family, friends and priests throughout the Diocese of Baton Rouge and beyond gathered to celebrate Father Mascarella’s life at a funeral at St. Aloysius Church in Baton Rouge on Jan. 28. Concelebrating the Mass was Father Mascarella’s great nephew and main celebrant Rev. Rusty Vincent, Bishop Michael G. Duca, Bishop Emeritus Robert W. Muench and the priests of the diocese. In his homily, Father Michael Alello, pastor of St. Thomas More Church in Baton Rouge, who was mentored by Father Mascarella, noted Father Mascarella did not select a typical Gospel passage for a funeral, but chose the passage in the Gospel of Luke where Jesus was dining at the house of a Pharisee named Simon and a sinful woman comes to Jesus. She brought an alabaster jar of perfume, and as she stood behind him at his feet weeping, she began to wet his feet with her tears. Then she wiped them with her hair, kissed them and poured perfume on them. Because of her faith, Jesus forgives her sins. And because of his brokenness, he stood up for the broken, testifying at the State Capitol on behalf of the disabled. He was literally “in touch” with the people, either by having them touch his hands with theirs so he would know where to place the body of Christ during Communion or having them guide his hands to their head when he gave them absolution during confession. “Today we celebrate – his life; his love of family; love of friends; his love of people,” said Father Alello. Other priests of the Diocese of Baton Rouge also spoke of the powerful influence Father Mascarella had on their lives. “He and I might not have agreed on everything theologically but we always got along,” said Father Jamin David, pastor of St. Margaret Queen of Scotland in Albany and a co-member of a clergy support group with Father Mascarella. “He was accepting of everybody, and made people feel welcome,” added Father David, who helped Father Mascarrella plan his funeral.